This month I have been assigned Plain Chicken for The Secret Recipe Club. I am in a new group as I wanted a later posting date, and so I am about to meet a whole lot of new bloggers, Steph being the first. Steph is from Alabama – a place I remember well from my trip to the South. Her one love is travelling, and we have that in common for sure. She loves New York City and it still ranks as one of my top cities in the world, even though I have not been there for over 20 years. Steph is hoping to visit Italy soon, and as you may know, Italy is my home away from home, il mio cuore vi appartiene Italia. 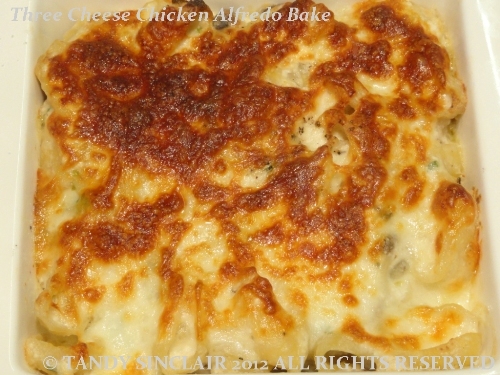 For my recipe I chose Three Cheese Chicken Alfredo Bake. Pasta is one meal we eat once a week, with Tandy Tuesday the inspiration behind this. I did not read the ingredient list before choosing this dish, so I have changed it a bit due to the fact that I cannot buy ready made sauces. They all contain sucrose which I cannot eat. I changed the premade sauce for my own béchamel sauce and Dave gave this dish a resounding thumbs up. I made two dishes from the ingredients, and we shared one! I always love your dishes and this one is no exception. Thanks so much for being such a big part of Presto Pasta Night over the years and particularly for helping to celebrate the big fifth birthday.. This looks like the ultimate comfort food! Next cold weather streak that we get here in Southern California, I am going to try this out. Great SRC choice! My sons favorite dish is Chicken Fettuccini Alfredo. I make a sauce I love, but now I “have” to make yours. 🙂 I love checking out different sauces. The baked part is very interesting, and it looks delicious! What a great choice. thank you Teri – we can swap sauce recipes! Never even heard of that sauce. The rest of it seems really yummy! Yummy!!! I make a four cheese fettucini that is usually a crowd pleaser. It’s actually supposed to be baked too but I just make the sauce and serve it over fettucini noodles with a myriad of optional toppings. i’m always a bit uncertain about chicken with cheese. to me its not the best combination. I don’t really know why. I’d rather have beef, fish or veg alone with cheese. Looks so lovely, creamy and cheesy. Pasta is always a great choice. I totally agree–homemade sauce is so much better for one. This looks like a dish I would like for dinner tonight! Welcome to SRC group c, you’ll meet wonderful bloggers! Cheesier is better! This dish would be very popular at my house! What a bunch of oeyyy gooey cheesy goodness! I love how the top is perfectly bubbled and golden, looks so good! Each time I use mushrooms I think of you! Simple and yummy – seems like the perfect comfort food. I cook for a diabetic, so I’m well acquainted with reading labels and cooking nearly everything from scratch. To be honest, I don’t mind because it’s probably healthier than the processed stuff in prepared meals and sauces. Your chicken looks delicious. All that heavenly cheese…this sounds like a winning dish for sure! How Fun! Tandy Tuesdays and meeting some new bloggers! this pasta dish looks so yummy and with the addition of the béchamel sauce and gnocchi I am sure it is a big hit in your family. I don’t know how to pass up Chicken Alfredo…this looks amazing. Great SRC choice. Homemade is best! (I hate to buy store-bought when you can make it yourself!) Great recipe and great SRC reveal! Oh my goodness, gracious. Looks great. What a decadent recipe – I bet is super tasty! Love that you made your own sauce – nothing better than a homemade cheese sauce. Glad to be part of SRC group C with you. Nice to meet you…I’m from Group C too. Love this comforting dish…I’m always looking for new ways to enjoy chicken! Sounds delicious Tandy! I don’t ever buy ready made sauces so would also have opted for making my own. Enjoy the new group and bloggers. Great Pick! I love Plain Chicken! Oh YUM! I love pasta and chicken and cheese – this would be a great addition to my weekly menu plan! So glad to have you in group C! This bake looks so good, and I prefer to make my own béchamel too, you get so much more control over the seasoning and ingredients and it is such an easy sauce to make. Tandy, this sounds soo good. I do not buy jarred sauces as well just because I love the fresh taste of homemade. The chicken and cheeses are a perfect combination of flavors.